Goetz himself acknowledged Mendelssohn, Schumann and Chopin as influences on the formation of his own language, and although his voice is an individual one it is clearly redolent of mid-century Romanticism. Though a very capable pianist, Goetz was not a virtuoso of the standard of Brahms or Liszt and his piano parts are generally simpler than theirs. He spoke of aiming at a ‘middle-difficulty Chopin technique’. The cream of Goetz’s solo piano writing is probably to be found in his two collections of short pieces, the nine Lose Blätter (Loose Leaves), op.7 and the six Genrebilder (Genre-Paintings), op.13. These two works collect the results of some twelve years’ work. The constituent pieces ofLose Blätter were composed in Winterthur between 1864 and 1869, and were published in 1870 with a dedication to Clara Schumann. TheGenrebilder were written in Zurich between 1870 and 1876, the year of Goetz’s death; they were published in that same year. The dedicatee in this case was Marie Goetz. While the individual movements making up the Genrebilder are of the same modest dimensions as those in Lose Blätter, they are generally speaking texturally richer and subtler in colouring. The delicately decorated first piece, in D major, after a poem by Robert Prutz, is a classic ‘Blumenstück’; while the second (depicting Theodor Storm’s ‘Girl with the bright eyes’) is a delightful, very Chopinesque scherzo in G. This is succeeded by an intimate and nostalgic Larghetto in E flat, a single page of music but one of the most affecting in Goetz’s piano output. The fourth piece is another poem of the wind – in this case the playful morning wind, which provides the theme for a scintillating study in continuous triplet semiquavers. There follows a stormy A minor movement inspired by the Romantic image of the solitary Wanderer; and the set ends with a tender cradle-song that provides a fitting conclusion to this sometimes child-like but never childish cycle. A long-forgotten figure of the high Romantic era, the composer Heinrich Donatien Wilhelm Schulz-Beuthen was born on 19 June 1838 in the town of Beuthen in Upper Silesia. He was intended for the profession of a chemist, and began studies at the University of Breslau, but his drive to write music was greater. From 1862 to 1865 he was a pupil of Moscheles and Reineke at the Leipzig Conservatory, where Grieg and Svendsen were among his fellow students; he also studied privately with Karl Riedel. Finding Leipzig’s classicism uncongenial to his more romantic temperament, after his graduation Schulz-Beuthen left Germany for Switzerland, where he met Wagner, the novelist Gottfried Keller, and became friendly with Mathilde Wesendonck. He also struck up a friendship with Theodor Kirchner, and created an orchestral cycle of arrangements of some of Kirchner’s piano pieces. Schulz-Beuthen taught in Zurich from 1866 to 1880. Following a nervous breakdown (the details of which are not precisely known) he returned to Germany and was unable to compose for several years, but resumed his teaching activities Dresden, where he lived – except for a short period spent in Vienna, 1893-95 – from 1881until his death on 12 March 1915. His last years were spent in an asylum. Schulz-Beuthen was a copious composer: his works include five operas, of which the first, Der Zauberschlaf, after a play by Mathilde Wesendonck, combines the stories of Sleeping Beauty and Cinderella and may well be the first example of the Wagnerian ‘fairy tale opera’ which became a popular genre in the late 19th century at the hands, most notably, of Humperdinck. Unfortunately the music is lost, as are many other of Schulz-Beuthen’s works. He had some distinguished admirers, including Franz Liszt, and contemporary critics often found his music daringly modern: however these judgements were passed mainly on works that are no longer available for examination. The bulk of Schulz-Beuthen’s music was never published, and it is believed that most of his manuscript works were destroyed in the fire-bombing of Dresden in 1945. Nevertheless enough was printed during his lifetime, or has come to light in recent years, to indicate a composer of considerable gifts. Perhaps the most substantial of Schulz-Beuthen’s surviving piano compositions is the Alhambra-Sonata, op.34 in F sharp, which he wrote in February 1878 following a visit to the famously ornate and exotic 14th-century palace of the ancient Moorish Kings of Grenada. (Though the work was not officially completed until 1882.) In a preface Schulz-Beuthen terms it a ‘Fantasie-Sonate’ and admits that the movements (a highly unclassical six in all) are not closely connected. The impression is really of an extended imaginative suite, but one exploiting a great range of pianistic textures. (In fact a number of performance indications, such as ‘quasi celli pizzicato’ for a staccato left hand figure, suggest Schulz-Beuthen may have intended an orchestral version.) He also states that he prepared himself for writing the work by consulting a study of ancient Arabic music written by his friend Alexandre Christianowitsch, containing many authentic melodies; and that while he did not employ these in the Alhambra-Sonata, the listener will ‘find the whole permeated by the rhythm and expression of ancient Arabian music’. 21st-century listeners are likely to find this ‘Arabian’ element a rather faint presence in a work that is predominantly redolent of the piano styles of mid-19th-century Europe, compared to the use that Spanish composers would make of such sources twenty and more years later. Indeed one of the fascinations of the Alhambra-Sonata is that here Schulz-Beuthen imaginatively visits locations that would later be evoked more ‘authentically’ by Albéniz and Falla. The first movement, ‘Auf dem Wege zur Alhambra’ (On the Way to the Alhambra) is a kind of extended pastoral prelude, whose glittering keyboard textures may be intended to reflect the flashing sunlight of Andalucia. ‘Bei der Marienkirche’ (At the Church of the Virgin Mary) is a solemn procession in B flat that modulating to a chant-like Andantino religioso in C. The movements of the Alhambra-Sonata tend to be connected by tonal links in which the key of the previous movement persists for a short way into the following one, before modulating to the main tonality of that movement. Thus the second movement’s C major tonality persists for the mysterious introductory bars of the third, ‘Eintritt in die Alhambra’ (Entry into the Alhambra), but the main part of this movement is a delicate but virtuosic scherzo in F sharp minor, perhaps to be associated with the play of fountains in the palace’s many courtyards. The fourth movement, ‘Die Abeceragen’, is designated a ‘Kampfspiel’ (Battle-piece), and is almost a turbulent tone-poem in its own right, modulating back from F sharp to C with a kind of central trio in E flat. After this a murmuring (mormorando) transition initiates ‘Im Garten Xeneralife’ (In the Generalife Garden). Subtitled a ‘Love-scene’, this fifth movement brings complete contrast of mood in an extended and passionate Andantino amoroso in E major, imagined as taking place in the ‘Garden of Paradise’ at the Generalife Palace to which the Moorish court would withdraw in the summer heat – a location that Falla also visits in his Nights in the Gardens of Spain. ‘Tragic’ chords recalling the Abencerages movement open the finale, ‘Nachklänge’ (Echoes), which draws all the disparate movements together by recalling their various themes, often in different tonal contexts (the pastoral themes of the first movement, for instance, now reappear in G major). F sharp major soon asserts its primacy, however, and the work ends in a joyous, flamboyantly glittering coda. The American-born pianist Kirsten Johnson dispatches the music with a flamboyance and panache that betrays her young age but certainly not her precocious talent, and she definitely succeeds in capturing all the nuances of the score with disarming ease. Die Klavierwerke von Goetz sind eine schöne Entdeckung. Stilistisch sicherlich von Schumann beeinflusst, nehmen die beiden Klavierzyklen durch ihre poetischen Stimmungen, ihre Konzentration auf das Wesentliche und ihre Intimität für sich ein. ….Die amerikanische, in Grossbritannien lebende Pianistin Kirsten Johnson nimmt sich der unbekannten Werke mit viel Engagement an. Ihr Spiel ist transparent und lässt die einzelnen Stimmen plastisch hervortreten. Technisch sind ihre Interpretationen untadelig, sie könnten einzig klangfarblich noch etwas differenzierter sein. Hermann Goetz (1840-76) was born in Konigsberg and studied mathematics and physics. He only began learning the piano when he was 17, but by the time he was 20 he was studying conducting, piano, and composition at the Stern Conservatory in Berlin. One of his teachers, Hans von Bülow, considered him one of his most gifted students. By age 23 he had moved to Switzerland, where he remained for the rest of his life. From 1867 an he was teaching, composing, and performing in Zurich and was considered the city’s leading musical figure. By the early 1870s he was considered one of German-speaking Europe’s central composers. Yet by 1872 ill health forced him to concentrate an composing. He died of tuberculosis in 1876. His piano compositions, like his playing, lack the all-out virtuosity of Brahms and Liszt. But they are products of what he called a “middle difficult Chopin technique”. The Loose Leaves were written in the 1860s and the Genre-Paintings were products of the 1870s. Both are rather Schumannesque. Heinrich Schulz-Beuthen (1838-1915) was born in Silesia where he studied chemistry initially. In the 1860s he gave himself to music and from 1862-5 he studied with Moscheles and Reinecke at the Leipzig Conservatory. He spent 1866-80 in Zurich. Following a nervous breakdown he moved to Dresden, where he spent most of the rest of his life. Although he wrote extensively…most of his manuscripts were destroyed in the fire-bombing of Dresden in 1945. It is known that Liszt admired his compositions, but many of his contemporaries felt him to be too daringly modern. Most of those compositions no longer exist, so we can’t judge them. Enough has survived that we know that he was a composer of considerable gifts…. … Die aus den USA stammende, jetzt in England lebende Pianistin Kirsten Johnson hat sich die Aufgabe ziemlich leicht gemacht. Sie verzichtet nicht nur auf die musikalisch durchaus berechtigten Wiederholungen, sondern auch auf Poesie und Ausdruckstiefe. Der Aufforderung «Frisch in die Welt hinaus! » kommt sie mit reichlich angriffigem Spiel nach; «Bei dir! »entbehrt der zu erwartenden emotionalen Wärme; der «Frühlingsgruss» gleicht mehr einer spielerisch gemeisterten Etüde als einem Stimmungsbild. Der romantischen Grundhaltung des Komponisten entsprechen am ehesten die auch klanglich differenzierteren Darstellungen des besonders ausdrucksvollen Stücks «Heimatklang» mit seinen Anlehnungen an Robert Schumanns Fantasie op. 17 und der ohne Frédéric Chopins melodische Eleganz kaum denkbare Epilog «Auf Wiedersehen!». Zur Aufwertung der in der Reihe «Musik aus der Zentralbibliothek Zürich» erschie-nenen CD trägt die auf die «Losen Blätter» folgende Gesamteinspielung der zwischen 1870 und 1876 in Zürich entstandenen «Genrebilder» op. 13 (Neuausgabe: BP 2272, Amadeus-Verlag) desselben Komponisten bei. Zwar gelten auch da die oben vorge-brachten Einwände, doch trifft Kirsten Johnson in diesen wesentlich kürzeren und prägnanteren Stücken den lyrischen Grundton der Klaviermusik von Hermann Goetz besser. Im abschliessenden Larghetto, einem zart gesponnenen Wiegenlied in der recht seltenen Tonart Ges-Dur, stösst die zuletzt von Ronald Smith ausgebildete Pianistin sogar zu beeindruckender Nachdenklichkeit und erstaunlichen klanglichen Feinheiten vor. 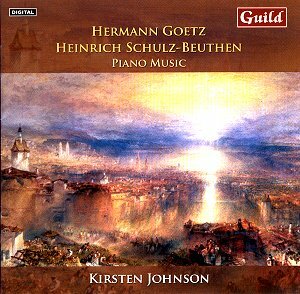 …The second CD mixes Herman Goetz with a single epic sonata by Schulz-Beuthen. The Lose Blätter are all quite short and each bears a descriptive title. The comforting warmth of Heimatklang (tr. 7) runs to 5:09 and sings like a benediction. The Liebescherze is halting and playful. Bei Dir! (tr. 5) is an unmissably dreamy piece in a Schumann-related idiom: all gentle zephyrs and wavering reeds. Fruhlingsgruss has the power of a Chopin scherzo and begins with something that sounds very like a rumba though the impression soon fades only to return at 00.50. …The Genre-Bilder are from Goetz’s years in Zurich from 1870 to 1876 the year of his death. … Each of the six Goetz pictures carries a superscription in the form of a poem whose mood is captured by the music. …Johnson injects some welcome hardness into the allegro impetuoso entirely appropriate to the Lenau poem. … Definitely for the admirers of romantic era piano music especially for those partial to Schumann and floral romance. Johnson, Guild and Macdonald have done a superb job – if you like one of these two CDs you will want the other as well. © 2019 Kirsten Johnson, Piano Explorer.